N64 Super Smash Bros. (JPN) "Break the Targets & Board the Platforms" in 08:05.92 by Isotarge & Mittenz. 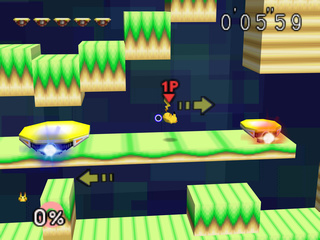 Super Smash Bros. began a series of games that mixes characters from several Nintendo-made games into a unique fighting game. It relies not on wearing down the opponent's "life" but increasing damage until he or she can be literally knocked off the stage. Wildly popular, this game has inspired many lazy days of casual multiplayer gaming but also intense competitive tournaments that happen to this day. In this run, Isotarge & Mittenz team up and tackle the two timed bonus games with all unlockable characters. Due to regional differences between releases of this game, the authors ran through both the Japanese and North American games. Ultimately, the Japanese version was deemed faster and published, but the North American run is available too. See the submission thread for more details, and for higher resolution encodes.